I had some super-lean hamburger in the freezer that is obviously not good for making burgers on the grill, so I decided to try something different. I found this recipe when looking for Korean recipes this week and decided to give it a shot. I deviated from the original recipe a bit and overall, I think they turned out well. This was a super easy week night meal that was fast and required only a few ingredients, most of which I already had on hand (I’m slowly building a good pantry which is extremely helpful and makes it easier to play with food when I have lots of vinegar, spices, herbs, and oils). The flavors in this dish are definitely Asian inspired and unless you tinker with the recipe, there’s not a ton of heat (you obviously can kick it up with some red pepper and a spicier chile sauce). This was my first time really experimenting with red chile sauce and I settled on Taste of Thai’s Chile Sauce. Not too bad, but I think I may try Sriracha chile sauce instead for increased heat. I mostly chose Taste of Thai this time when comparing ingredients and realized it did not contain preservatives, which I always appreciate. I may also experiment with some chile peppers, too. Oh the decisions! Mix the ground beef, garlic, sherry, soy sauce, red chile sauce, brown sugar, and ginger in a medium bowl until well browned. Spray a large nonstick skillet with nonstick spray and set over medium heat. Add the beef mixture and cook, breaking it apart with a wooden spoon, until cooked through, about 3 minutes. Stir in sesame oil. 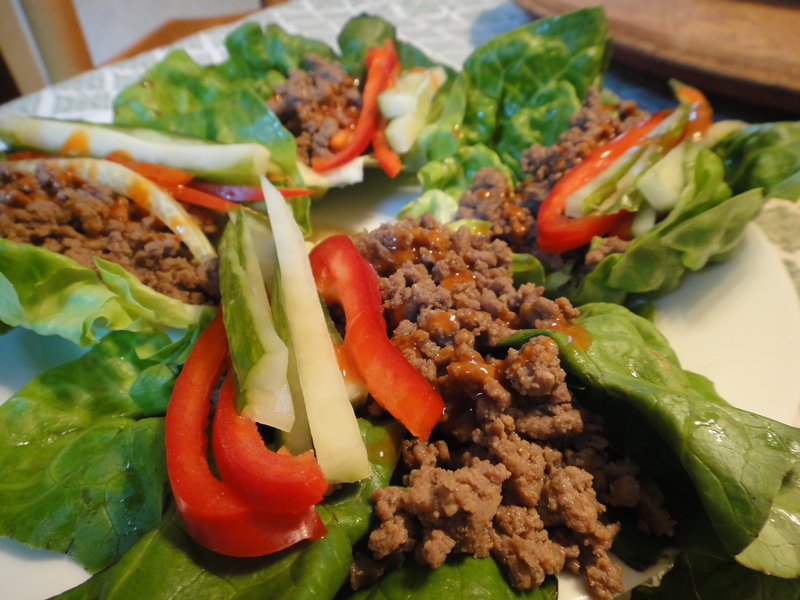 To serve, place 1/4 cup cooked ground beef mixture in each of the lettuce leaves. Top each with sliced cucumber and sliced red pepper and drizzle with additional chile sauce if desired. Serve at once.